​This page was created to provide resources for teachers interested in incorporating chronic oil pollution into their curriculum at high schools, colleges, and Maritime Academies around the country. Here you can download the Marine Defenders lesson plans for use in your classroom and also watch two versions of Oil In Our Waters, a documentary film about the whistleblowers, environmental scientists, and coast guard investigators on the front lines of the battle against illegal oil dumping. click on the links below to Learn more about oil pollution, its health impacts, and key laws about marine oil pollution. Learn about the extent of intentional oil pollution! Explore the health impacts of oil! Read about key international and US oil pollution laws! Oil in Our Waters is a documentary film that tells the story of the whistleblowers, environmental scientists, and coast guard investigators on the front lines of the battle against illegal oil dumping. This 23-minute film vividly illustrates the extent of the problem, explains the origins of MARPOL and the US laws to control oil pollution, and dramatizes the impact of oil on the marine environment, and the penalties faced by polluters caught in the United States and is a great general introduction to these issues for high school students, college students and Maritime Academy cadets. Oil in Our Waters: Environmental Version from Common Good Productions on Vimeo. Oil in Our Waters is a documentary about the whistleblowers, environmental scientists, and coast guard investigators who are protecting our marine environment from illegal oil dumping. ​This 10-minute version below focuses on the environmental issues related to intentional marine oil pollution and is a great introduction for middle school and high school classrooms. The Marine Defenders education module satisfies the new Marine Environmental Awareness requirement of the Standards of Training and Certification for Watch-Keeping (STCW) certificate issued the International Maritime Organization (IMO). • Download the Marine Oil Pollution Lesson Plan. 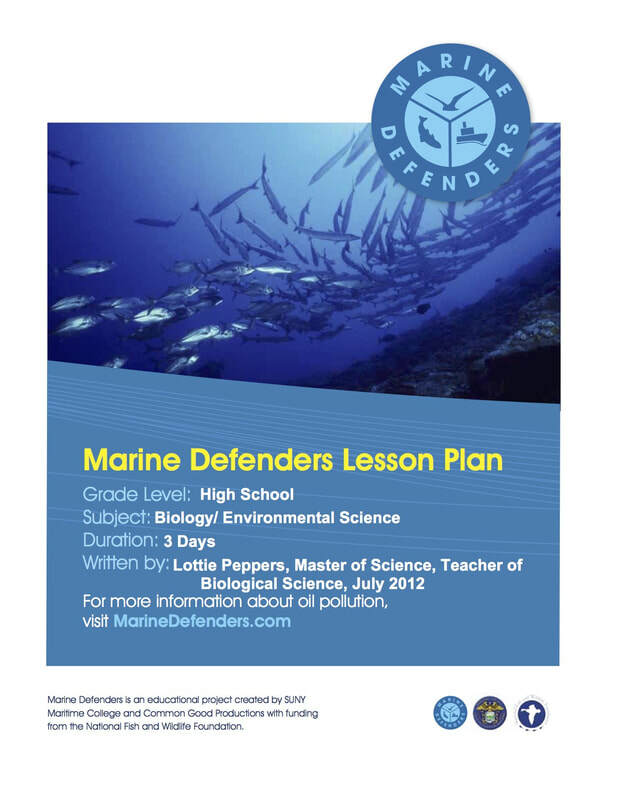 The Marine Defenders high school lesson plan is a three day unit that teaches students about oil pollution and marine debris. Developed by Lottie Peppers, Master of Science, Teacher of Biological Science. This lesson addresses the environmental impacts of chronic oil pollution and is intended for use in college level environmental science or biology courses. The 30-minute lesson is intended to educate recreational boaters about the environmental impacts of spilling small amounts of oil in the water, the laws pertaining to oil pollution, and the responsibilities of boaters who see or spill oil in the water.